Thankfully, it was a sunny May afternoon when our scheduled day for the floatation test arrived. With the three Ps (planning, people and persistence) we managed to test most of the boats in our fleet. We used the method required by the Class Rules: 35 kg of lead placed in the boat (simulating the sailor’s weight), flood it with water, then rock the boat to remove any trapped air. At this stage, Doug Bell (CAN 68) recorded each partially submerged boat with its proud owner looking on. Doug gave the photo evidence to our Class Measurer, Bruce Millar (CAN 39), for a permanent record of each test. All eight boats tested that day passed with flying colours. Being new to the 2.4mR class, I was a bit skeptical of the adequacy of this test. 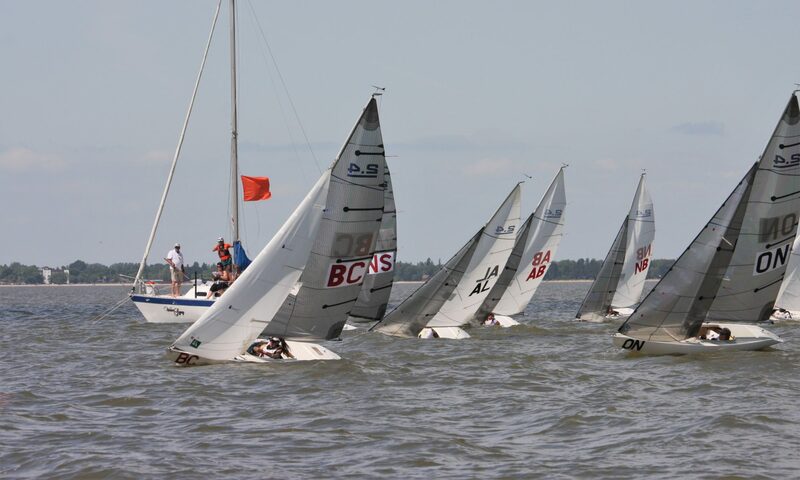 I know it is possible (although not advisable) to submarine a boat in 25 or 30 kts of wind and also that boats can fill up quickly especially when it is wavy, or on a busy start line, or when pumps fail, which they inevitably do. 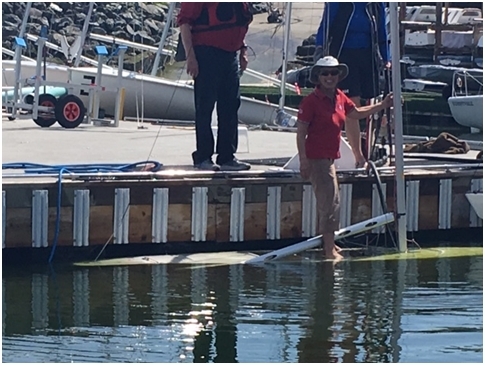 Having flipped and turtled dinghies in Caddy Bay in years past I know how cold that water is! Staying with your boat or, better yet, on top of your boat is very important. So I needed to be sure my 2.4 had plenty of reserve buoyancy. To satisfy myself, my solution was to climb aboard my boat full of water and the 35 kg of lead. Yes! It remained afloat…..well, awash…..but it did not sink. Just to be sure this was not an anomaly, I performed this same test on three additional boats. I’m happy. Let’s go sailing.